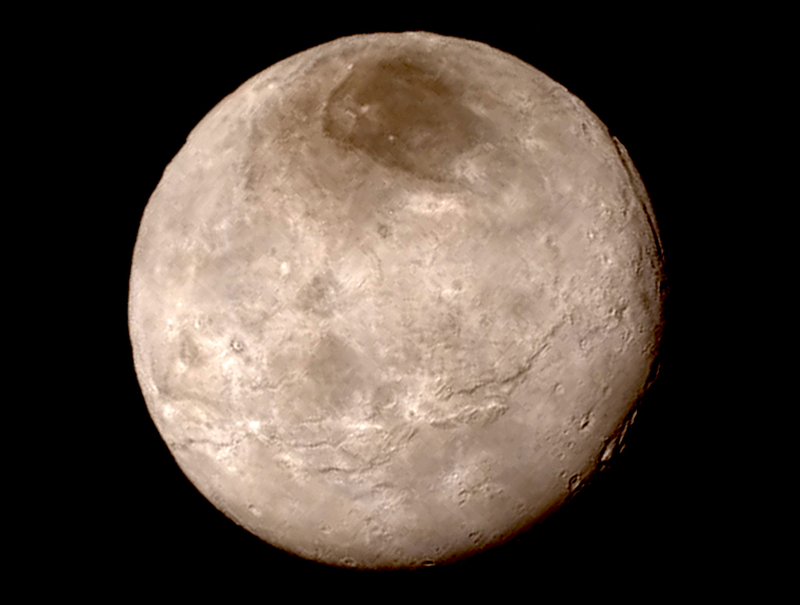 Any prediction/explanation on why pluto is brown (and charon is not?). If nobody has one I'll make a wild guess and say it's feldspar. Very interesting that there are no "impact" craters so far. That is going to be hard for the mainstream to handle. They'll have to invoke a high level of geologic activity, I would think. That might be hard for them to pull off, but the people who invented Dark Matter and roaming volcanoes on Io are capable of anything. I believe in them. 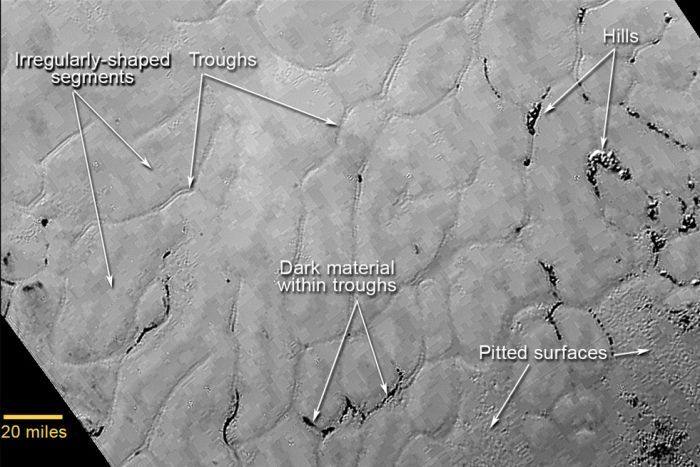 The lack of EDM craters - although Stephen Smith posted a picture of Pluto with LOTS of hexagonal shapes! - is interesting for us, too, although not nearly so detrimental to our theories. What does this suggest about the history and provenance of Pluto. Any thoughts? They say tidal heating cannot account for it, since Pluto and Charon are in tidal equilibrium.They suggest an internal ocean or internal radiation may be implicated in the energy budget. Or just simple, stored volcanic heat from its genesis? They say the surface appears young, and maybe it literally is young - younger than the solar system. Could it be an offspring of Neptune or better yet, Saturn? Besides the observation that craters seem to be rare -- the pic reveals mountains of up to almost 3000 meters. Geologists believed until now that mountains can only be a product of plate tectonic and a warm, active core. Moderators, I suggest merging the three Pluto threads. If most planetary electrical scarring is due to said interloper not only would Pluto's distance from the sun decrease its interaction/scarring from a more dispersed energy but the distance would also increase the odds of it not being involved in an interaction at all. To electric model followers, it would seem Pluto is young comparatively. Which could easily account for a lack of a plethora of craters. However; if Pluto was born of interaction, by an interloper, it would not necessarily have to be part of said interaction but a result of a system wide equation of charge. Interesting how Pluto is bigger than previously thought. I wonder what that does to the perturbation calculations? Clyde Tombaugh's discovery of Pluto in 1930 appeared to validate Lowell's hypothesis, and Pluto was officially named the ninth planet. In 1978, Pluto was conclusively determined to be too small for its gravity to affect the giant planets, resulting in a brief search for a tenth planet. The search was largely abandoned in the early 1990s, when a study of measurements made by the Voyager 2 spacecraft found that the irregularities observed in Uranus's orbit were due to a slight overestimation of Neptune's mass. Steve Smith wrote: Moderators, I suggest merging the three Pluto threads. Steve, please better think next time before you give such kind of advices! -- I just got a notice from one of my Twitter followers that my Tweet with an embedded link to my fresh topic about Pluto here -- I intentionally started as a new one -- didn't work. As I see in my link history there were more than 80 clicks within appr. one hour, which is not bad as it might have drawn new readers to thunderbolts.info. Luckily I could delete my old tweet in time and made a new one -- with the changed link -- right now. I wanted to start a new thread on purpose as this conundrum implies something totally different -- and you can see from some other contributions following up my post ("Blowing My Mind") the science community is scratching their heads as well already. 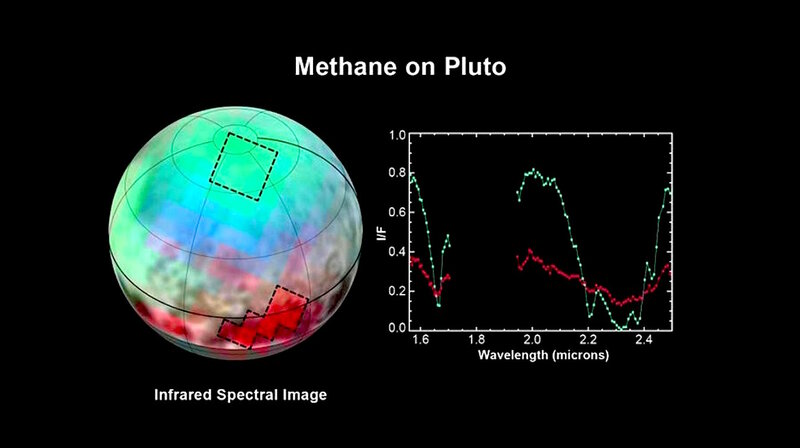 This is Geology and has nothing to do with "predictions" and moreover THIS could develop as one of the most discussed topics over the whole Pluto/New Horizons mission. - After all I had the feeling always that Geologists are much more prepared and willing to change their mindset than those Astro... -somethings. Less prejudice! Pluto has been declared the "king" of the Kuiper belt, being the Outer 'ring' of the solar system. It is in 2:3 orbital resonance with Neptune, meaning their orbits cross, but harmonically, so they don't crash. That would seem to suggest, that if there was at one time a solar system disruption centered around Saturn; that Pluto and Neptune were flung off one way and the inner planets the other way, by EG orbital mechanics. Imo, the Outer planets will be less dense, not rocky like the Inner planets. Noting that the images of the "mountains" appear to have something like 'vents' at their peaks, possibly hinting at some supercritical phase 'liquids' beneath the crust. ...it's all conjecture based on the mainstream's dodgy mass and density estimates. Dodgy because they assume all heavenly bodies have no net electric charge and that only gravity is responsible for orbits (from which mass & density are derived). I suspect that in future, as Pluto moves away from perihelion, its charge will decrease and as a result we will find that it's rotation/co-orbital period with Charon gets shorter as the electrostatic repulsion between the two is reduced. FS3 wrote: I just got a notice from one of my Twitter followers that my Tweet with an embedded link to my fresh topic about Pluto here -- I intentionally started as a new one -- didn't work. Sorry about that, but we merge and move threads all the time, it is part of normal forum maintenance. Anyway, I do not think that anyone who truly wants to learn about the EU and the TB project will be discouraged by a dead link.